Curly Tale Fine Art - "100 Tea Pots"
The idea for this exhibition stemmed from my desire to further explore the teapot form as a personal challenge as well as a study and a presentation. 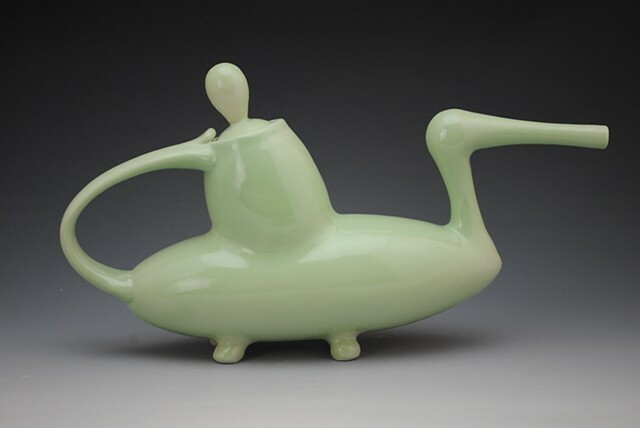 My hope was that when I was finished I would better understand the teapot form and the process of which I make it. One of my mentors once spoke of making 100 of something in order to become more informed of the subject. By working through a form over and over again one can come to appreciate some of the nuances involved in its creation, and by doing so improve the working process as well as the final outcome. I used the opportunity to try a variety of different styles, some more traditional and others more unique to my own design. The limitations that I set for my teapot forms were that they all needed some sort of handle; spout, lid, and they needed to be able to contain and pour liquid. In all I made around 170 teapots for this project, some of them never made it to the final stages to be finished, many others made it to those final stages but failed to make the cut. A man who described himself to me as a tea master once commissioned me to make a tiny teapot to hold 100 milliliters. He explained that there are certain types of tea, which are to be drunk and appreciated in very small quantities for an individual user. This challenged my admittedly limited notion of what a teapot was supposed to be and what tea is and how its enjoyed. There are so many different interpretations of the teapot, the form can take all kinds of shapes and sizes and personalities. The possibilities are seemingly endless; this presentation is a tiny scratch on the surface of another scratch of the surface of what teapots can be.